Strike up the band! The resistance band that is. Resistance bands are a must-have toning tool in every exerciser’s arsenal. This small piece of equipment allows for strength and flexibility training at your convenience. These easy-on-the-joints bands are a safe alternative to heavy weights and offer great results without a gym membership. Pack your handy bandy and the following exercises in your bag for your next workout, to use at the office, or even on vacation. Holding the resistance band handles in both hands, position the resistance band beneath your right foot and take a step back with the left foot. Simultaneously lower the body and pull the handles up into a bicep curl. The left knee should be hovering above the ground while the palms are facing up toward your shoulders. Complete 12-15 repetitions on this leg then repeat on the opposite side. 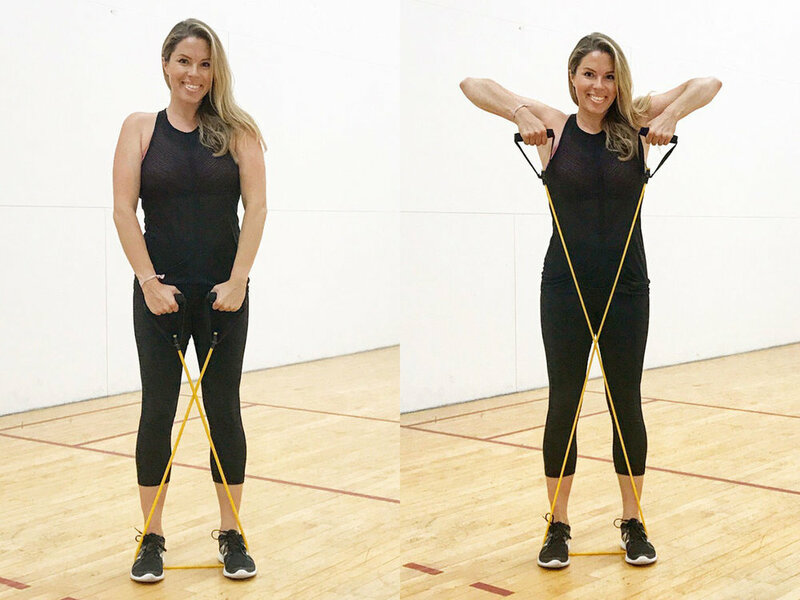 Begin by standing on the band with your feet shoulder-width apart and cross the handles of the band so the equipment forms an ‘X’ in front of the body. Engage your core, keep the knees slightly bent and pull the handles up toward the armpits. In the upward phase of this exercise, keep the neck relaxed and the elbows positioned straight out from the body. Start in a seated stance, with the band placed at the center of the feet. Your hips and knees should be bent at a 90 degree angle, while your torso is at a 45 degree angle to the floor. Keep your back straight and hold the handles firmly as you twist your torso slowly to the right then to the left. Continue rotating from side to side for 30 total repetitions.